Two representatives of Family Design Resources Inc. were among the presenters at the Adoption Support and Preservation National Conference, held June 1-2 in Nashville, Tenn. The national conference gives professionals and leaders in the field of post-adoption services the opportunity to share and discuss effective practice and policy at the state and national levels. Brenda Lawrence, executive director, was part of a lunch panel presentation, “What’s Working: An Introduction to Thriving Post-Adopt Programs in Pennsylvania, Illinois and Tennessee.” She provided an overview of Pennsylvania’s SWAN post-permanency program model. That afternoon, Lawrence and Lea Moyer, post-permanency technical assistant, co-presented “Navigating a Difficult Journey,” focused on the challenges associated with the dissolution or disruption of an adoption. 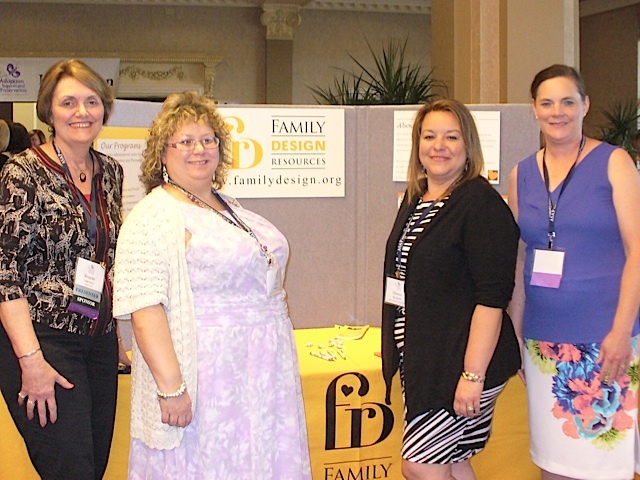 Family Design Resources was one of the national conference sponsors and exhibitors. Photo from left: Lawrence and Moyer were joined at the conference by Denise Sheffield, post-permanency technical assistant, and Fawn Davies, program manager.